Chicken Coop Ventilation – Let's Air This Out - FREE CHICKEN COOP PLANS! 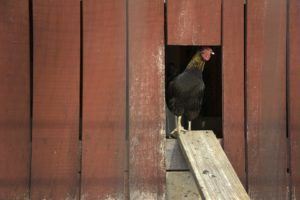 If you’re in the process of building your coop, or even if you’ve already built your coop – read on to learn more about the importance of adding chicken coop ventilation. Although it may be something that seems simply optional, inadequate ventilation in your coop can make your flock sick! 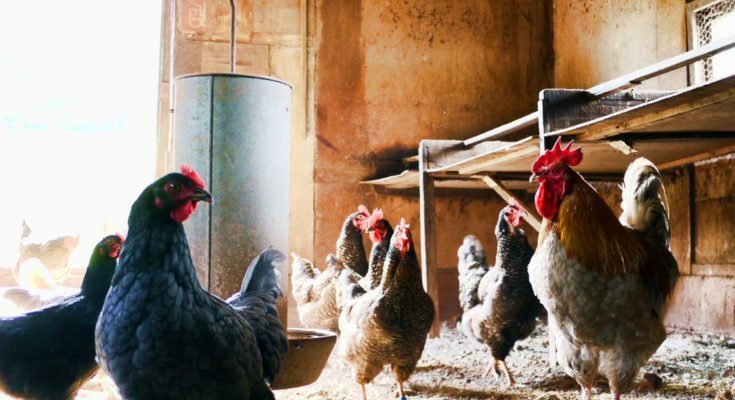 In this article we’ll delve into the importance of chicken coop venting, it’s importance for the health of your flock, and different ways to ventilate your coop to make this happen. 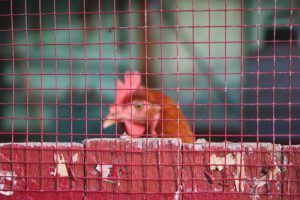 Why Is Chicken Coop Ventilation Important? Chickens produce a lot of ammonia from their droppings and, without proper ventilation, the toxic smell and fumes can build up quickly. Without adequate air movement expelling these fumes, the chickens can get sick quickly and die. Also, having a few chickens in a coop pooping, breathing etc. creates a humid environment. Combined with dust particles floating in the air, your flock could be breathing in all that air and getting set up for some serious health problems, often respiratory in nature. And although chickens are rather hardy birds, this type of exposure can take them out in short order! As you already know, chickens love digging and scratching in the dirt or loose bedding in your coop. Taking dust baths is an instinctual behavior to help combat mites, lice, and the like. 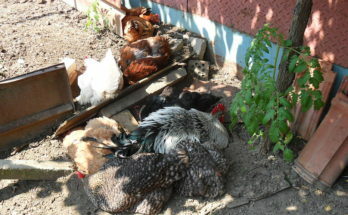 So although taking a dust bath is a good thing…breathing in those dust particles in a confined coop is not! Proper ventilation in your coop will help prevent this from becoming problematic to the health of your flock. So whether it’s hot or cold outside, your coop needs adequate venting to reduce these particles from hovering in the air during a wild dust bath. 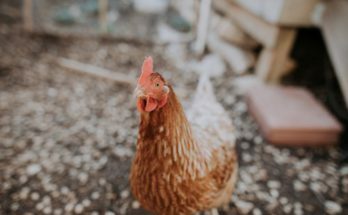 This is a no brainer regardless of where you live – chickens will die of heat in a coop with no or poor ventilation, especially when you combine the heat with the above factors of ammonia build up and flying dust particles! Does A Coop Need To Be Well Ventilated In Cold Weather? Although it makes total sense to have your coop adequately vented in the summer heat…what about in COLD, windy, winter weather? I was surprised to learn that having adequate ventilation is equally as important in the colder months as during the hot summer periods. 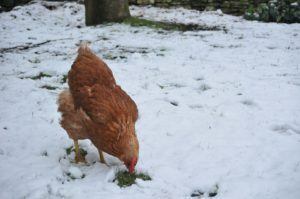 Chickens Survive Fine In Cold Temperatures. I learned that the reason chicken coop ventilation is key in the winter is for removing (or at least reducing) the humidity levels in the air. Ammonia fumes will not build up as quickly in the winter, but the humidity levels can be very high. Some of this is dependent on where you live as well, as Winter can feel cold in very different ways. For example, we live in the Pacific NW part of the US so we get several months of rain and higher humidity in the winter months. In the Midwest (where we grew up), the air is more dry in the winter, but still very cold. In either geographic location, ventilation is important. In cold, dry weather the coop can still build up with carbon dioxide, a silent killer for your flock…and in the damp cold winters (like in the Pacific NW), the humidity build up can make them sick. My Coop Is Drafty…That Provides Adequate Ventilation Right? WRONG! Let me explain…there is a common misconception out there in “chicken circles” that believes the open door to the outside of the coop, a few cracks along the seams, a leaky window, a small hole in the floor etc. all contribute to good ventilation. Unfortunately this isn’t often true. The above scenario often has air blowing in from all directions, simply making the coop cold. These drafts in a coop are not set up in a way that properly eliminates the ammonia, humidity etc. Chickens can get sick or develop frostbite from cold (or damp) air blowing directly on them. Proper ventilation is accomplished by having the air enter and exit through the coop, away from the birds. For example, ventilation that is provided in the form of a couple screened windows is great…the air can enter in one window and blow out through the other. Or, by adding holes near the roof line of the coop will force the dirty, humid air up and away from your chickens. Is An Automatic Chicken Coop Door Helpful For Reducing Drafts? Something to consider in your coop to eliminate drafts from below the roosts (floor level) is having an automatic chicken coop door opener. By shutting the coop door at night, the cold draft won’t enter your coop. 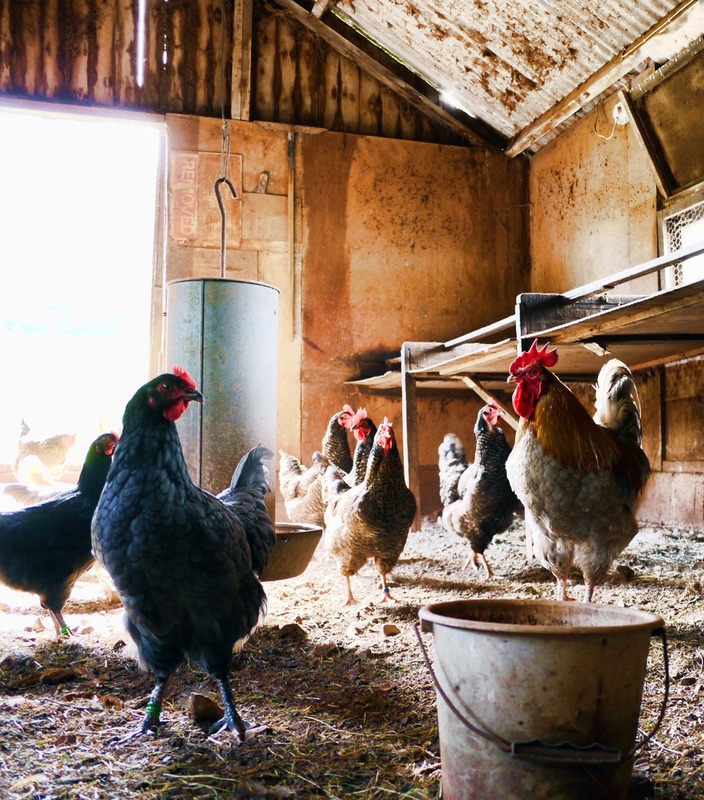 A lot of this will depend on your roost placement…if you have a larger coop and your roosts are positioned away from the door opening it may not be an issue. But if you have a small coop, the draft from that door could be a bigger issue. We’ve never used a chicken coop door in the winters and our flock has fared well over the years. But if your preference is to keep your birds away from draft, an automatic chicken coop door may work nicely for your feathered friends. 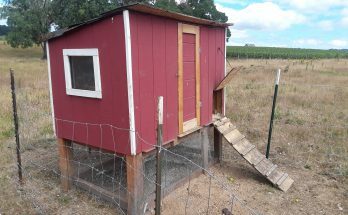 We want to add that you don’t need to use an automated chicken coop door…you can always just go out to the coop each night to shut it manually, and then open it the following morning…we were just thinking of a way to make that chore easier. So just HOW does one provide adequate ventilation? It’s actually pretty simple. If you look at your coop and don’t believe it provides adequate ventilation, simply drill some 1 inch, 1 1/2 inch, or 2 inch holes near the roof line of your coop – nothing to it! That’s the simplest way to air out your flock. I’ll add here that if you drill holes that size, it’s smart to staple some chicken wire over the holes (stapled on the inside) to prevent smaller birds from getting inside. Screen mesh is fine, as it will also keep out bees, flies etc. However, I like to keep those holes as open as possible so use chicken wire with large enough openings to provide great ventilation, but small enough that other birds (or predators) can’t enter. You can also add a metal vent louvre or two. If you have one window in your coop, along with the little door going out to the run…that isn’t too bad. However, it’s not ideal if you have your roosts placed directly above that little door since that cold air can still blow onto your birds. If you want great cross-ventilation, add another vent or, better (and easier), drill some holes near the top of your coop to increase air flow. This keeps the fresh air circulating through but does not freeze your chickens like cold air blowing on them from below. Adding a screen or additional window is totally fine but, to me, seems very labor intensive. Drilling a few holes at the top of the coop is much easier and less damaging to your coop. For more on Coop design, see this article. Can I Insulate My Coop And Still Achieve Good Ventilation? Many people want their chickens to be as comfortable as possible in either cold or hot weather, and this makes sense! We want our chickens to be happy and healthy so they keep laying eggs and have a good life…but insulating a coop may not be the best idea unless done correctly. There is a lot of debate out there on this topic – some chicken farmers are adamant that the chickens should be warm in the winter so they won’t get frostbite. Others think this is unnecessary as chickens are hardy and do fine in cold temperatures as long as they have adequate ventilation, food, and water. We think you can have it both ways! We’ll qualify this by saying this is our best educated opinion. Insulating your coop IS a great idea as long as the chickens have adequate ventilation for getting rid of all the humidity, dust, carbon monoxide etc. Adding ventilation near the roof line in the form of vents, drilled holes, or small windows allows for this. Your chickens will be plenty warm if you place your roosts below the venting, but won’t feel the ill effects of too much draft. Our personal preference is not to insulate. We’ve found that they do much better with cross ventilation near the top of our coop. After 15 years of raising chickens, we’ve had no issues with respiratory illnesses this way and the birds don’t look too uncomfortable. But hey – you can do whatever YOU feel is best for YOUR flock! As long as your coop is properly ventilated, you should be fine either way. We hope you’ve learned about the importance of properly venting your coop. If you have any questions or comments about the issue, share them below. We don’t claim to have all the answers and love learning from other chicken farmers!